Signed picture of Marlon Broomes the Blackburn Rovers footballer. Home » Signed picture of Marlon Broomes the Blackburn Rovers footballer. Marlon Broomes. This is a fabulous A4 size picture of Marlon Broomes the Blackburn Rovers footballer. The picture is taken from a MATCH football magazine of the time and has been hand signed by Marlon Broomes using a black sharpie. 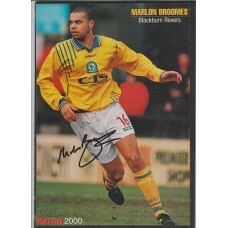 Marlon Broomes played just 31 league games for Blackburn Rovers between 1994 and 2001. Broomes played for the England under-19s. He was called up into the England-under-21 setup in the 1997–98 season. He played twice for the Under 21s. He took part in the 1997 FIFA World Youth Championship, playing two games as the England Under-20 team got to the quarter finals of the tournament. Lovely hard-to-get item.